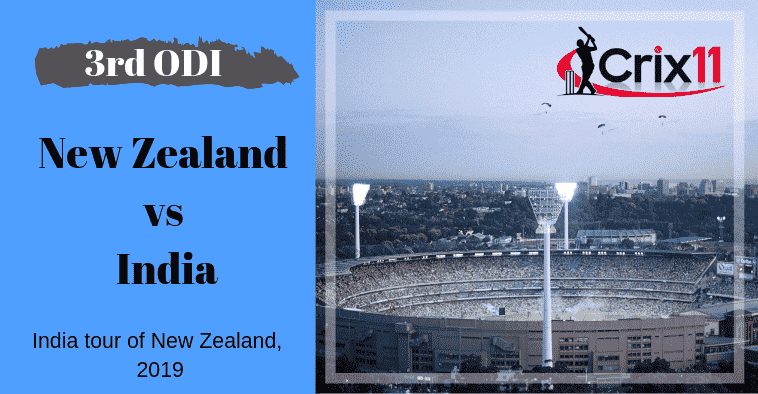 Today Match Prediction of New Zealand vs India, 3rd ODI Match Preview, Playing 11, Injury updates, News and Dream11 Prediction. If you are looking for IND vs NZ Dream11 Prediction then you are are the right place. India is all set to take on the New Zealand on Monday, January 28, 2019, at Bay Oval, Mount Maunganui. If you want to know who will win then you are in the right place. In Today’s Dream11 Fantasy Cricket Match of NZ vs IND, we will cover Pitch Report of Bay Oval, Mount Maunganui, Predicted Playing 11, Toss Prediction, and Fantasy Cricket News and Tips. Who Will Win Today Between IND vs NZ 3rd ODI? New Zealand, who seems to be a strong opposition has lost both the matches back to back. The spinning duo has been a nightmare for the Kiwis. They have failed to stand in front of the Indian bowling attack. Even the batting was not up to the mark. Kane Williamson, Doug Bracewell, Ross Taylor and Tom Latham are the top scorers of NZ team. They have scored 84, 64, 46 and 45 runs. Lockie Ferguson and Trent Boult are the top wicket-takers. They have taken 3 and 2 wickets. On the other hand, India has proved continuously why they are of the best contender for the World Cup 2019. They have continued their winning streak from Australia. Virat Kohli will play his last match before he goes to India. Hardik Pandya is back in the squad this will surely make the Men in Blue more strong. Shikhar Dhawan, Rohit Sharma and Virat Kohli are the top scorers of Ind team. They have scored 141, 98 and 88 runs. Kuldeep Yadav, Mohammed Shami and Yuzvendra Chahal are the top wicket-takers. They have taken 8, 4 and 4 wickets. Martin Guptill, Colin Munro, Kane Williamson, Ross Taylor, Henry Nicholls, Tom Latham, Trent Boult and Lockie Ferguson are the key players of New Zealand Team. Kane Williamson will lead the NZ Team. Martin Guptill, Colin Munro and Kane Williamson will lead the batting department. Ish Sodhi, Lockie Ferguson and Trent Boult will lead the bowling department. Mitchell Santner may replace Colin de Grandhomme in the playing 11. Batsmen: Martin Guptill, Ross Taylor, Kane Williamson, Henry Nicholls, Colin Munro. Bowlers: Tim Southee, Lockie Ferguson, Trent Boult, Ish Sodhi. Martin Guptill, Ross Taylor, Ish Sodhi, Colin Munro, Mitchell Santner, Kane Williamson(c), Colin de Grandhomme, Tom Latham(w), Lockie Ferguson, Henry Nicholls, Trent Boult, Doug Bracewell, Matt Henry, Tim Southee. MS Dhoni, Virat Kohli, Rohit Sharma, Shikhar Dhawan, Kuldeep Yadav, Yuzvendra Chahal, Bhuvneshwar Kumar and Mohammed Shami are the key players of India Team. Virat Kohli will lead the IND Team. Virat Kohli, Rohit Sharma and Shikhar Dhawan will lead the batting department. Bhuvneshwar Kumar, Mohammed Shami and Yuzvendra Chahal will lead the bowling department. Hardik Pandya may replace Vijay Shankar in the playing 11. All-Rounders: Kedar Jadhav, Hardik Pandya. Bowlers: Yuzvendra Chaha, Bhuvneshwar Kumar, Mohammed Shami, Kuldeep Yadav. Virat Kohli(c), Ravindra Jadeja, Ambati Rayudu, Kedar Jadhav, Rohit Sharma, Shubman Gill, Shikhar Dhawan, Bhuvneshwar Kumar, MS Dhoni(w), K Khaleel Ahmed, Vijay Shankar, Yuzvendra Chahal, Kuldeep Yadav, Mohammed Siraj, Mohammed Shami, Hardik Pandya, Dinesh Karthik. Note: Try to play in small leagues to win all the matches. It is going to be a do-or-die situation for the Black Caps. They have already lost the last two matches and if they failed to win the third ODI then India will take the driving seat. If we look at the statistics of the last five matches, NZ has won only one match and IND has won rest of the four games. According to our astrology prediction, Ind will win the toss. The team winning the toss should opt to bat first as chasing can be a difficult task on this ground. The wicket may slow down in the second inning. According to our astrology prediction, NZ will win the toss and ask IND to bowl first. Match India tour of New Zealand, 2019, NZ vs IND, 3rd ODI. Venue Mount Maunganui, Bay Oval. Time 02:00 AM GMT, 07:30 AM IST, 03:00 PM LOCAL. The same ground and even the same pitch will be used in the third ODI. If you have watched the last match then you could have easily make a fair idea about the wicket. The Mount Maunganui, Bay Oval will be good for batting especially in the first inning. The spinners will come into the game in the latter half of the match. Dream11 Fantasy Cricket Tips: Try to take top order batsmen and spinners in your dream 11 fantasy cricket teams. The weather of Mount Maunganui is predicted to be sunny and it will remain the same throughout the day. The sky will be clear and there is no sign of rain today. The temperature is expected to be 27-Degree Celsius and the humidity to be 63%, which may go up to 78%. Fantasy Cricket Expert Tips: The weather condition will favour the batsmen and the spin bowlers. IND vs NZ Dream11 Tip of the Match: Try to take five batsmen, two all-rounders and three bowlers in your teams. This is it for Today’s IND vs NZ Dream11 Fantasy Cricket Match Prediction of 3rd ODI. Read the complete post and win in any fantasy cricket league. Leave a comment below and share the post so that others can also find Crix11 which is the best fantasy cricket prediction site. Don’t forget all the information on this website is absolutely free and if you utilize the data correctly your winning chances is 100% sure.